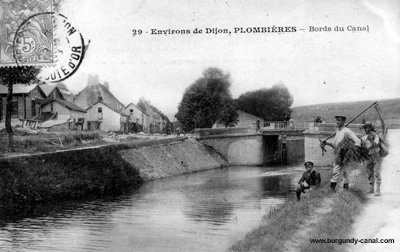 Plombieres les Dijon is a now suburb of Dijon. Beside the small port which is now managed by Locoboat, you'll find a couple of restaurants. For bread and groceries you should take a bicycle or walk into the town. You can follow the signs to a small friendly supermarket. The port is an ideal place for a halt with deep moorings, if you find the port of Dijon to expensive or over crowded. There are some very nice old buildings and traditional roofs in the town.